Through the centuries buildings have manifested the technological achievements of their age, be they the vast vaulted structures of ancient Rome, the soaring masonry of mediaeval cathedrals, or the prefabricated ironwork and glass of the Crystal Palace in London for the Great Exhibition of 1851. Australia's foundation as a nation generally coincided with the Industrial Revolution in Western Europe and North America but many of the buildings of its first century were conceived and built along traditional lines; houses, schools, churches, cathedrals and town halls all continued to be traditional in concept and construction. One of the principal architects responsible for the transfer of building technology from Europe to Australia in the early days, was the temperamental Francis Greenway, who was transported to Australia in 1814 for a forgery offence committed in 1812. His work was notable for skills in using local sandstones, the proportions and grand-ness of his designs and the estranged relationship between himself and the authorities. His most prominent early structure was the Macquarie Lighthouse at South Head. Macquarie commissioned him to design a new Government House and he immediately designed a castle and began a stable block so grand that it was often mistaken for Government House itself! In spite of curbs by Macquarie and later by his successor Governor Brisbane on Greenway's extravagance, he produced over the next twenty years some of the finest colonial buildings Australia ever had, including St. Matthew's Church, Windsor, N.S.W. (Fig. 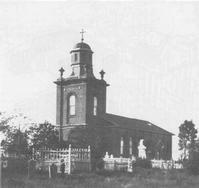 48) and St. Luke's Church, Liverpool, N.S.W. One of the first of many great public buildings erected in Victoria was the State Library in 1854. It was designed by Joseph Reed, an early architect who established the distinguished firm now known as Bates Smart and McCutcheon. One of the most conspicuous features in this splendid building is the reinforced concrete dome. It was designed, some fifty years later, by a distinguished Australian engineer and citizen, Sir John Monash, and at that time was the largest dome in the southern hemisphere. Sydney Station, built at the beginning of the 20th century and one of the city's major public buildings before the advent of the Opera House, illustrates the dichotomy between technology and tradition. Its front is a traditional stone-built 'palace' with a dominating clock tower, concealing the modern technology of the 'train shed' concourse and the trains behind. Such a duality was considered entirely proper, and office buildings of the day likewise concealed their plentiful use of structural steel behind portentous facades of cut stone and the Classical Orders. Today this has markedly changed, and technology often becomes the dominant aesthetic of major buildings, such as the frankly expressed structural system of the Qantas tower in Sydney (1982: architects: Joseland Gilling & Partners; structural engineers: Miller, Milston & Ferris). Even the previous taboo concealing services has gone, and in the TAA Sydney Airport Terminal, the exposed air conditioning ducts are exploited for their visual effect (1974: architects: Don Gazzard & Partners).